It’s often a challenge to address the ICS cyber security conversation in an organization that has yet to suffer a cyber incident. While the issue of defending against traditional IT cyber breaches goes uncontested ICS owner/operators still struggle to align traditional cyber threat vocabulary and remediation methods to their operational environments. Both malicious and unintentional cyber threats are not confined to data breaches and IT systems but they can be harder to identify in ICS environments. You have to know what you’re looking for. Joe Weiss has amassed a database of more than 700 confirmed control system cyber incidents. The database covers ICS cyber from around the globe. A vast majority incidents were not identified in official reports as being cyber-related but a review of the circumstances surrounding the event proves otherwise. A cyber incident in a large, complex industrial control system can have serious consequences, and all security technologies have limitations. This means we can always be more secure, or less. How then, should we evaluate security funding requests for industrial sites? How do we know how much is enough? The abstract, qualitative models that most of us use for cyber threats are poorly understood by business decision-makers, and are not easily compared to risk models for threats such as earthquakes and flu pandemics. We could force-fit cyber risks into more conventional models by "making up" numbers for the probability of serious incidents, but "made up" numbers yield poor business decisions. Most business leaders though, do understand cyber attack scenarios and their consequences, and find them much more useful than qualitative models or "made-up" probabilities. To communicate industrial cyber risks effectively, an assessment process should distill complex risk information into a small, representative set of high-consequence attack scenarios. Business decision-makers can then "draw a line" through the set, selecting which combinations of attacks, consequences and risks to accept, and which to mitigate or transfer. Join us to explore using attack scenarios to communicate risks, consequences, and costs to business decision-makers. Register today to gain actionable insights on how to defend your websites and APIs for the coming year of threats. Bonus: All registrants will receive a copy of Distil Networks’ 2016 Bad Bot Reports and a copy of the presentation slides. Attackers are moving away from direct assault, and instead are hijacking and exploiting user credentials to thwart security tools, and gain easy access to business data. How can you strike back and stop breaches that attack your users far, far away? Join Chris Webber, Security Strategist at Centrify, and Eric Hanselman, Chief Analyst at 451 Research, as they discuss todays’ identity-based security risks, and how to arm yourself against them. Big data analytics and smarter sensors are just two of many technologies leveraged by many companies enhancing their Industrial Control Systems (ICS) to reap the benefits of the Industrial Internet. However, as you design these smarter and increasingly connected systems, security must be built in from early stages, or else you risk others, with malicious intent, using your systems against you. This session will describe a process for helping you frame your security needs and meet them smartly to be sure that you are efficiently and effectively tackling security “end-to-end” and not leaving any weakest links unprotected as you evolve your ICS to capture the opportunities driving the excitement behind the Industrial Internet. About the Speaker: Brian Witten is a Senior Director for “Internet of Things” (IoT) at Symantec. Join SecurityWeek and Dan Maier, Sr. Director Product Marketing at Zscaler, for a compelling webcast full of key insights and findings from this research. Don’t miss this event. Register today! As cloud apps like Salesforce, Office 365, Google for Work, and ServiceNow become the norm, organizations need to enable secure access and maintain compliance. They must also bring under management a growing variety of personal devices, including laptops, smartphones, tablets, and wearables that are being used to access business systems and data. How do you manage user identities and cloud app access in real-time, while keeping sensitive data secure? Join experts from Imperva and Centrify as they share best practices on enabling the safe and productive use of cloud apps. Register now so you’re ahead of the fast-moving intersection of cloud apps, BYOD, and identity management. You already know the power of application segmentation to deliver data center and cloud security—now you can take segmentation to the next level. Nano-segmentation is finally a reality. Data breaches continue to be top of mind for organizations large and small. Two key dynamics are making that challenge much harder — the cloud and the growing sophistication of attackers. Cybersecurity has become more than a technical problem. A data breach can have a major impact on your business – loss of jobs and customers, reduced brand reputation, stock price drops and more – with recent research placing the average cost of a breach at $2.7 million dollars. Yet too many organizations continue to drown in low-level threat data and individual response tactics, with security teams pouring through hay stacks that may or may not contain that “needle”. In this webcast we will look at how to effectively manage Macs in the enterprise as well as mobile devices leveraging your existing IT infrastructure. The growth of Mac in the enterprise is undeniable. Apple’s success with the iPhone and iPad is bleeding over into end user preference for laptops. Where Macs used to account for only low single digit percentages of devices deployed and were therefore largely ignored, they are now growing across all verticals and industries and represent a significant challenge for IT. Attend this webinar to find out more on how to align, automate and enforce controls to security and compliance policies – while providing visualization, workflow and reporting critical to improving operational efficiency and reducing audit costs. Rick Roach, Senior Vice President, Cyber Security Solutions for Digital Management, Inc.
Are your privileged users putting your business at risk? You might be granting your users too much privilege - even unintentionally - and dramatically increasing your potential attack surface. If over-privileged user credentials are compromised - or worse, misused by a disgruntled employee - your data and systems can be put at risk and your sensitive data can be stolen. Making you tomorrow’s headline. Brad Zehring, Director of Product Management at Centrify, will discuss how insider threats - both seen and unseen - develop and offer approaches you can use to reduce your attack surface and mitigate the threat. Mobile devices are becoming the preferred platform for online banking, commerce and accessing business applications. In the recent Black Friday to Cyber Monday weekend, mobile devices accounted for 39 percent of online transactions. This increased reliance on mobile is driving an increase in fraud and cybercrime attacks through mobile devices, with organized cybercriminals deploying sophisticated attacks that exploit mobile technology. Cybersecurity and fraud prevention professionals require defenses specifically designed to protect against losses and exposure from mobile attacks. Attend this webinar to understand how to protect transactions from native mobile applications and browsers in real time, without adding friction to the user experience. 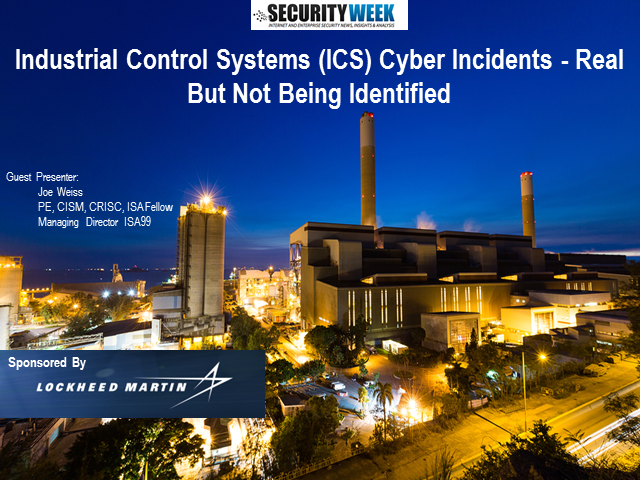 While awareness over the need for improved cybersecurity in SCADA and Industrial Control Systems (ICS) has improved in recent years, several inaccurate and dangerous assumptions about ICS cybersecurity best practices and the nature of cyber threats still persist. If held by organizations as fact, these myths could result in inadequate cyber-defensive measures and a high level of exposure to a range of attacks or even simple accidental cyber incidents both of which could have equally concerning consequences to process availability and safety. Ken Jochims - Director of Product Marketing, ThreatMetrix, Inc.
Fraud and other forms of cybercrime continue to plague all companies with an online presence, with sophisticated cybercriminals launching attacks on logins, payments, and account origination. Security and fraud prevention professionals are challenged to keep pace with evolving trends and protect against attacks that threaten customers, employees, revenues and data – all without impeding user experience. Knowing the latest attack trends can help focus your detection and prevention resources to reduce risk and losses. Attend this webinar to learn how to leverage findings in The ThreatMetrix Cybercrime Report, based on actual cybercrime attacks detected during real-time analysis and interdiction of fraudulent account logins, online payments and registrations. This report gathers data from over 850 million monthly transactions, including findings from this year’s Black Friday – Cyber Monday weekend. Almost half of IT security professionals reported they experienced compromised or misused Secure Shell (SSH) keys in the last 24 months. The majority of the survey respondents rely on overburdened system administrators to self-govern their SSH keys. Unfortunately the result is ineffective security practices that leave the organization exposed. In this webinar, you will be provided with some recommendations how to mitigate the vulnerabilities that exist that exploit SSH keys and the gaps within an organization that leaves SSH keys vulnerable to these attacks. Scott Simkin, Sr. Manager in the Cybersecurity group at Palo Alto Networks. Advanced Persistent Threats (APTs) are being used to compromise organizations around the globe with increasing sophistication, persistence, and evasive attack methods. Join Palo Alto Networks and SecurityWeek for a webcast with live interactive Q&A that will take you straight to the heart of the cyber underground. By now most organizations have responded to the Heartbleed vulnerability, the question as to whether or not organizations have indeed fully remediated the vulnerability is still open. The reason for this is that many organizations perform ‘lazy’ certificate rotations, and do not create new keys. It’s also been proven that the Heartbleed vulnerability impacts mail servers, chat servers, VPN’s, network appliance and client software. Over 50 security vendors have also confirmed that their solutions are vulnerable. It is paramount that all keys and certificates be replaced within the enterprise network, patching only publicly facing web servers is not sufficient. SecurityWeek's Webcast Channel - Join us for information webcasts to help you better defend your organizations from cyber threats.